I think it was supposed to be an activated ability that could only be activated while the card was suspended. The player would suspend it for X turns, at the end of those X turns, the save state is lost and the game can progress. If the opponent can force the player into such a bad position that they need to restore the save, then they can force them into the same position again after the save, and the spell just wasted everyone's time. If the opponent waits for the save to invalidate, then the spell just wasted everyone's time. In any case, it's a waste of time, and is usually worse than Peek or Serum Visions , that cost less mana, give you the same information and replace themselves. But, then I realized that the creator of this card is just a troll account, trying to make custom cards that break the game in different ways. So in my opinion, Cerulean Wisps is a must have. Also, i have tried Turn Aside to get rid of pesky removal ( Path to Exile , Assassin's Trophy etc. ), which works very well. 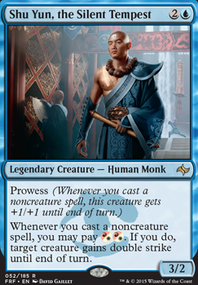 The Cerulean Wisps just serves as a somewhat better Mutagenic Growth , and allows you to cast things like your Manamorphose . I run a sideboard of two Kiln Fiend , just in case they remove my Blistercoil Weird . Also Storm Entity just in case they can stop your Blistercoil Weird from attacking. also, Peek gives you insight into their hand to see whether you should combo or not. The dream would be if Gitaxian Probe got unbanned and then it would let this deck go off, but sadly, it is banned. 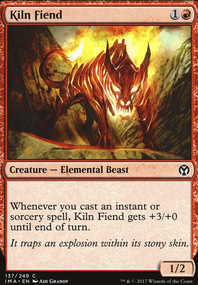 The Crimson Wisps / Expedite are for if you get another Blistercoil Weird / Kiln Fiend later in your turn. I haven't tried it yet, but i think a couple of Faithless Looting are in order for those lands that you don't want in your hand. Last thing, have you considered Young Pyromancer , because i have them in sideboard and they can go pretty crazy. back in my heyday here I would often use the site's playtester to playtest my deck vs any same format decks in the queue, which led me to playing maindeck Grafdigger's Cage to a gp grinder finals split (I didn't want to go and he was willing to split everything but the byes to me). 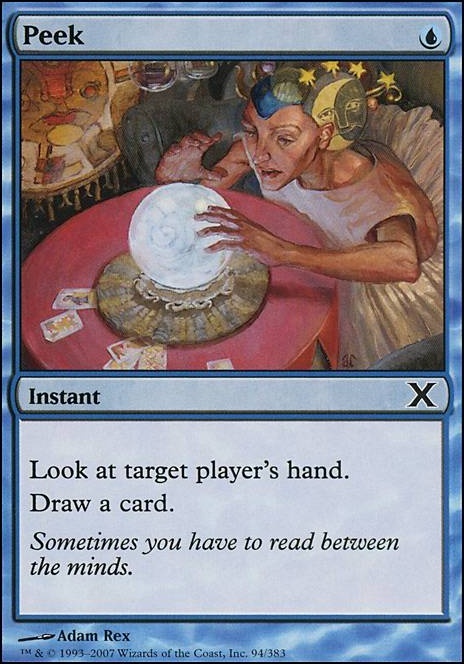 The best way to get better at mtg is to play mtg in a way where you can analyze each play and take the time to think about how strong each card can be in an average match up. Hell while you're at it think about the other user's decks and give advice, write why you think a card choice would be good for them, once you can really do that well you will probably find your ability to play and brew decks jump dramatically (or be able to defend playing Peek in w/u modern control). your deck kinda vanished for a bit when I was first writing this comment, there was a bit more depth in when I first typed this out, but me more tired now than before lol. Now maindecking Duress would be rather good vs tier 1 lists outside of humans. Bojuka Bog is rather good as a means to graveyard hate for a deck that still wants access to it's graveyard for delve. Striped Riverwinder or Whirlwind Adept could be viable wincons for the topend to deal with single target removal from slower decks. Spreading Seas is about the only land hate spell that's viable to fight tron and other decks with strong lands at common. Peek could be an interesting option vs opt, the information of your opponent's hand could be vastly more important than a scry 1. Logic Knot is rather good of a counterspell with a delve theme. Hieroglyphic Illumination a pretty good card advantage spell used by usually w/u control, early game it fuels delve, late game you can gain card advantage at instant speed. APPLE01DOJ on Verity Circle In U/W Control? So far in testing, Verity Circle has performed quite well. I'm only running it as 1 of. It's not a turn 3 play by any means, it's more of a turn 10 play when you can fully utilize it's potential. 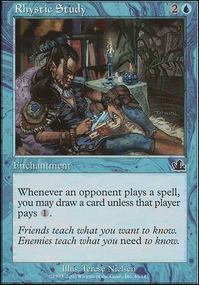 When people want to attack first to bait out your Cryptics, this fills the shoes of a psuedo cryptic quite nice, taps their creature(s) and draws you a card while allowing you to keep your counter in hand for main phase 2. In addition, something I didn't initially realize you can Opt > Miracle Terminus > Tap their creature/draw a card in response. Now as far as the U/W discussion in this thread, which I'm quite enjoying, here are my thoughts. I don't like Logic Knot, been very unhappy with it in every deck I've ran it in. It can be a dead card a lot of the time. If I go turn 1, tapped Colonnade, turn 2 Island, Mana Leak is fully operational where Logic Knot is fully dependent on the opponent Thoughtseizeing me and not taking it, and if they do that, they're probably not going to play into it unless their plan is to get the counters out of the way. Sure it can be good late game but I prefer more early game interaction (2x Spell Pierce, 1x Spell Snare) since the late game is where U/W Control shines. I find Glacial Fortress clunky and don't want it to be stuck in my opening hand. T1 Colonnade, T2 Fortress is just not the business. I can see the value of it if I faced Burn a lot. I prefer the singleton Mystic Gate over Glacial Fortress though. The 4 shocks haven't caused any issues. Demarge I think Peek can be worth running as 1 of, it's nice that it draws you a card but for the space it takes I prefer Telepathy since the effect is permanent. 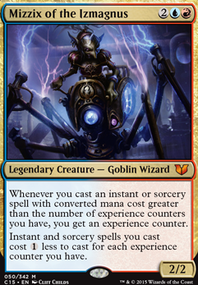 I'm not big on Thought Scour, I think it's better in a deck splashed red or black. Maybe if Dig Through Time was ever unbanned. Demarge on Verity Circle In U/W Control? Now I have been digging through w/u control a lot and I can say I don't think I'll ever see a constant exact 75 and that can simply be because of how control functions unless your decks are for mtgo it's unlikely your decks are tuned to fight the same meta, if 4/5 rounds of the tournament you see 60 copies of grapeshot and 3 creatures I'm sure a version with mainboard leylines and no board wipes would perform a lot better. Now settle is good for w/u control because it functions at instant speed like most of our interaction and can cause opponents to 2nd guess what we're holding up, the problem with it is humans has freebooter to see our hands and exalted triggers allow the vial decks to turn settle into a 4 cmc path. 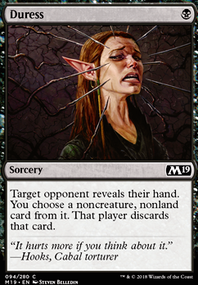 oust is good for being a way to get under thalia tax for targeted removal it also plays well with how often w/u control can make people shuffle along with natural fetch land use by opponents. 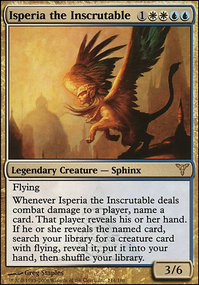 in matchups where you need to miracle terminus jace is often too slow anyway, cycling gets under thalia tax and you often have to still pray for that natural miracle. Mana Leak functions better than knot in meta where rip could be a mainboard viable option or where early game counters are more important (though it is likely not needed when there's mainboard spell piece). Now what about that Peek game, or using Thought Scour as a cantrip, it makes snap and knot better, a kind of shuffle away jace brainstorm. Or the mainboard crucible option.